He studied in the Studio of painting and drawing at the Saratov Society lovers of fine arts (1891−1896) at G. P. Baracchi and V. V. Konovalov, in the Bogolyubov drawing school (1897), the Moscow school of painting, sculpture and architecture (1897−1904) at A. E. Arkhipov, N. Kasatkin, L. O. Pasternak, V. A. Serov, K. A. Korovin. Taught (1918−1930) in the State free art studios, Higher art and technical studios, Higher art and technical Institute. 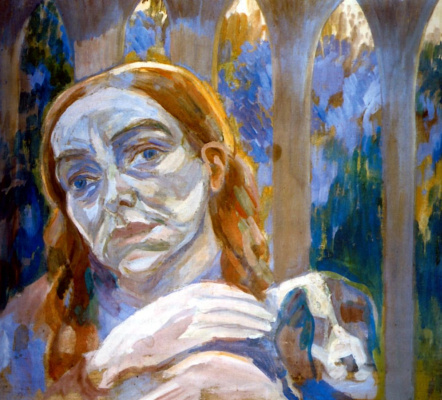 Participant of the exhibitions of the Moscow society of art lovers (1901), "the World of art" (1902, 1906, 1911−1918), "scarlet rose" in Saratov (1904), Moscow fellowship of artists (1905), "Blue rose" (1907), "Garland" (1907−1908), Golden fleece (1908−1910), the Union of Russian artists (1906, 1907, 1909), "4 of art" (1925), Association of artists of revolutionary Russia (1928), foreign. Honored art worker of the RSFSR (1929). Nature has given P. Kuznetsov brilliant and beautiful gift of inexhaustible energy of the soul. The feeling of enthusiasm for life never left the artist to a ripe old age. Art was for him a form of existence. By fine craft Kuznetsov could join as a child, in his father’s Studio-the painter. When the artistic talent of the boy was clearly determined, he entered the Studio of painting and drawing at the Saratov society lovers of fine arts, where he studied for several years (1891−96), under V. V. Konovalov and G. P. Salvi-Ni-Barakki. An extremely important event in his life was the meeting with V. E. Borisov-Musatov had a profound and positive impact on the Saratov artistic youth. In 1897 Kuznetsov brilliantly passed the exams in MUZHVZ. He studied well, standing out not only the brightness of talent, but also a genuine passion to work. In the years Kuznetsov was under the spell of the beautiful artistry of K. A. Korovin; it was no less profound disciplining effect of V. A. Serov. At the same time, Kuznetsova rallied around a group of students, who later became well-known members of the creative community, "Blue rose". From impressionism to symbolism — this is a major trend that defined the search Kuznetsova in the early period of creativity. 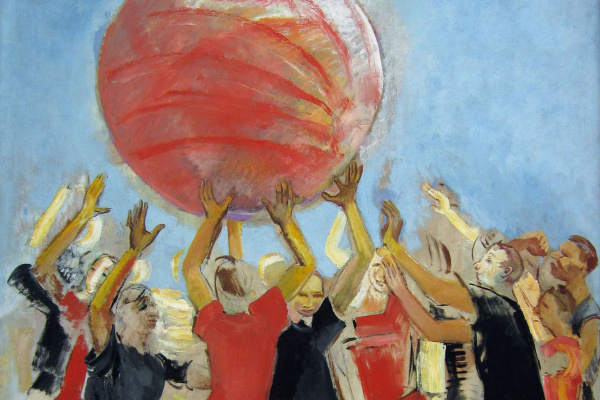 Paying tribute to plein-air painting, the young artist tried to find a language that could depict not so much the experience of the visible world as a state of mind. In this way, right up painting closer to poetry and music, as if testing the limits of visual possibilities. 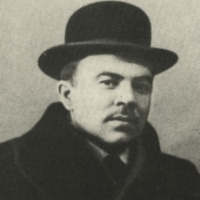 Among the important concomitants — participation Kuznetsov and his friends in the design of symbolist plays, cooperation in the symbolist magazines. In 1902, the Smiths with two friends — K. S. Petrov-Vodkin and P. S. Utkin — made the experience of painting in the Saratov Church of the Kazan mother of God. Young artists do not embarrass yourself observance of the canons, giving free rein to imagination. A risky experiment provoked a storm of public indignation, accusations of blasphemy, — the mural was destroyed, but for the artists themselves, this experience was an important step in the search for a new pictorial expression. By the time the Moscow school of painting (1904) and the symbolist orientation Kuznetsova was clearly defined. Special importance is given to scenic open Borisov-Musatov. However, the balance of the abstract and the concrete, which marked the best Musa Lithuanian mousse thing, is not peculiar symbolism Kuznetsova. The flesh of the visible world is melting in his paintings, his picturesque vision almost surreal, woven from images of shadows, indicating the subtle movements of the soul. Favorite kuznetsovskiy motive is the fountain; the sight of the water cycle, the artist was fascinated as a child, and now memories of this rise on canvas, varying the theme of the eternal cycle of life. 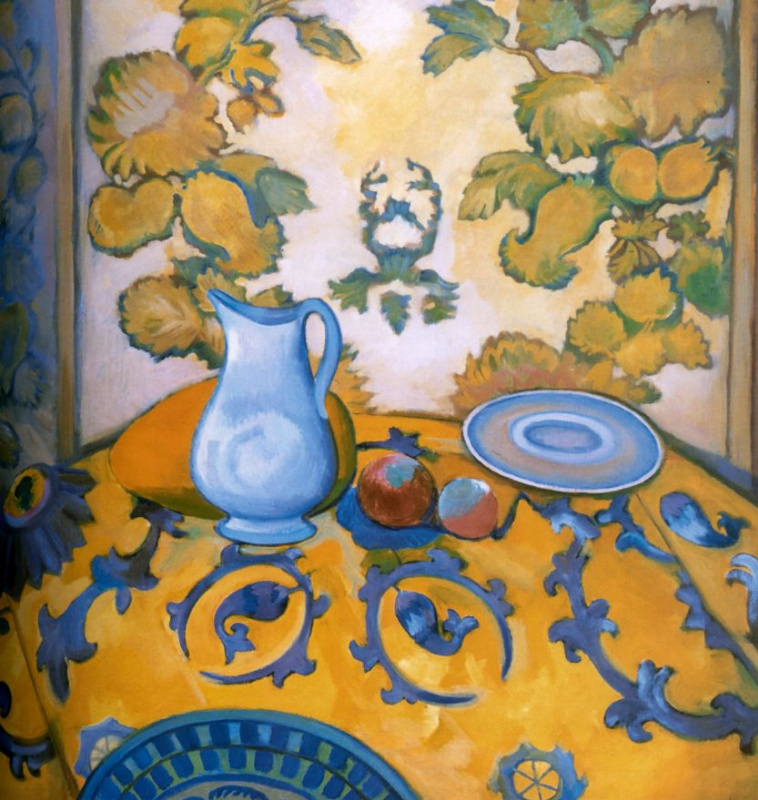 As Musatov, Kuznetsov prefers tempera, but uses its decorative features are quite peculiar, as if with an eye to the techniques of impressionism. 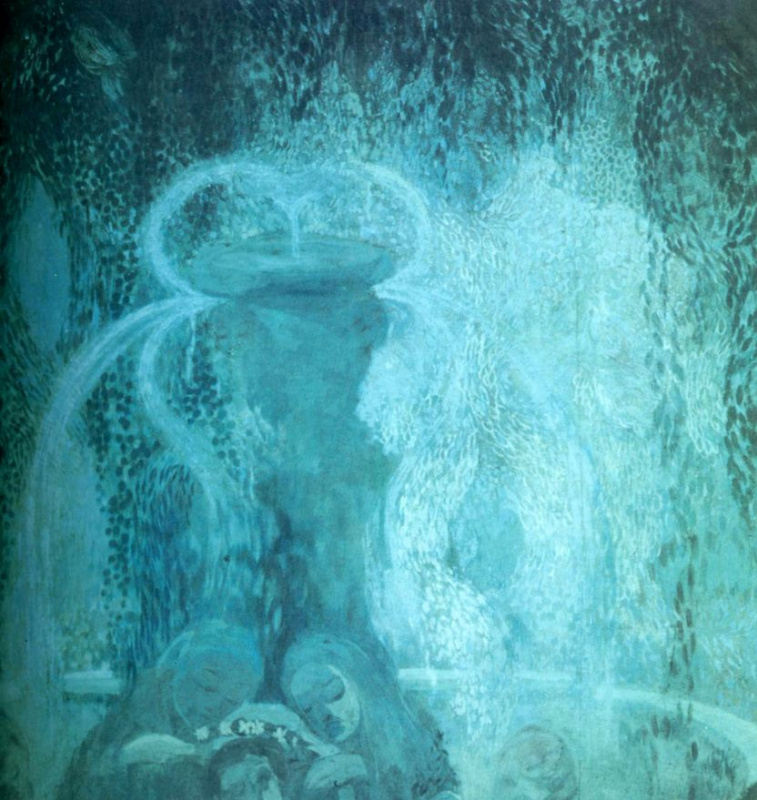 Razbelennye shades of color as if seeking to merge into one just painted light and the picture appears shrouded in fog color ("Morning", "Blue fountain", both 1905; "Birth", 1906, etc.). Kuznetsov soon became famous. The artist was not yet thirty, when his work was included in the famous exhibition of Russian art, arranged by SP Diaghilev in Paris (1906). The apparent success resulted in the election of Kuznetsov, a member of the Salon d’automne (this honor was not awarded to many Russian artists). 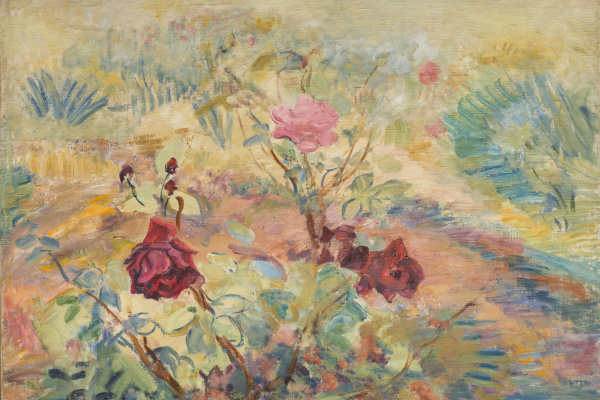 One of the most important events of Russian artistic life of the century was the exhibition "Blue rose", opened in Moscow in the spring of 1907, Being one of the initiators of this action, Kuznetsov acted as the artistic leader of the entire movement, which since then is called "goluborozovskoy". 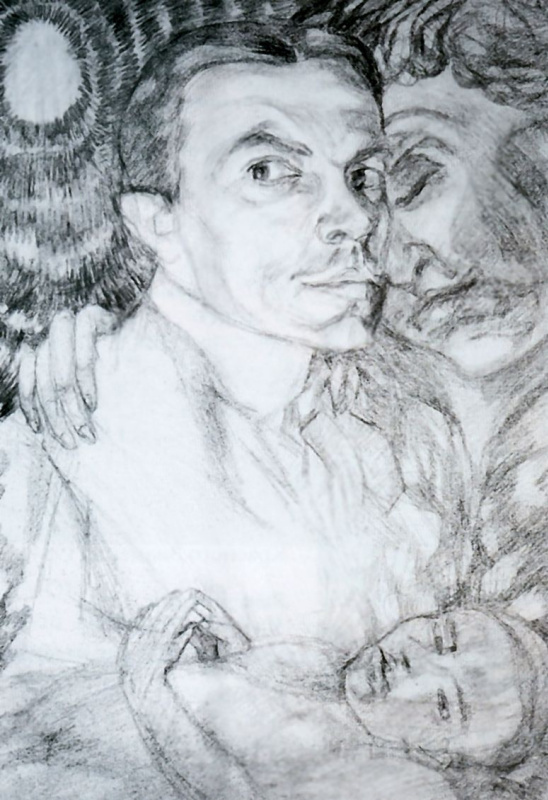 In the late 1900s, the artist has experienced a creative crisis. The strangeness of his work often becomes painful, and he seemed exhausted and not able to justify its hopes. Even more impressive was the revival Kuznetsova, who applied to the East. A crucial role was played by the wanderings of the artist in Zavolzhsky steppes, travel to Bukhara, Samarkand, Tashkent. In the early 1910s Kuznetsov made the paintings "Kirghiz Suite", which signifies the ultimate flowering of his talent ("Sleeping in the shed", 1911; "sheep Shearing", "Rain in the desert", "Mirage", "Evening in steppe", all of 1912, etc.). With the eye of an artist like sleep veil: its flavor without losing the fine nuances, were filled with the power of contrasts, the rhythmic pattern of songs acquired the expressive simplicity. 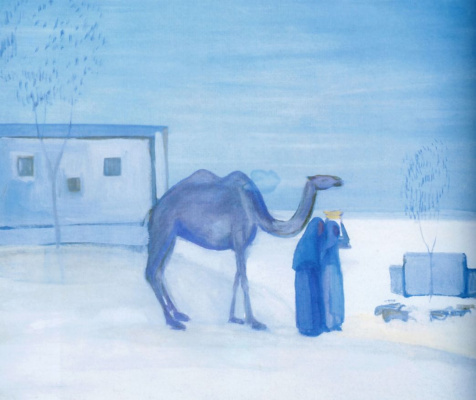 Kuznetsov peculiar nature of his talent contemplation gives pictures of the steppe cycle pure poetic sounding, lyrically heartfelt and epic-solemn. Attached time to this work "Bukhara series" ("Teahouse", 1912; "the rookery", "a Buddhist temple", both 1913, etc.) demonstrates the strengthening decorative qualities, causing theatre Association. In those same years, Kuznetsov writes a number of still lifes, among them the excellent "still life with Japanese print" (1912). The growing popularity Kuznetsova helped to expand his creative activity. The artist was invited to participate in the painting of the Kazan railway station in Moscow, performed sketches ("harvesting", "Asian Bazaar", 1913−14), but they remained unfulfilled. In 1914, the blacksmiths worked with A. Y. Tairov at the first staging Chamber theatre performance "Sakuntala" Kalidas, had a great success. 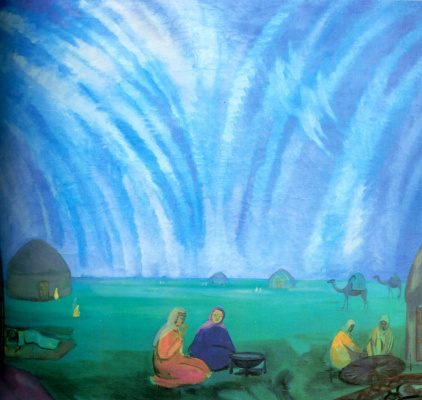 Developing the rich potency Kuznetsova-decorator, these experiences undoubtedly influenced his painting, which increasingly gravitated to the style of monumental art ("Divination", 1912; "Evening in steppe", 1915; "At the source", 1919 — 20; "Uzbek", 1920; "Attendant", the beginning of the 1920s, etc.). During the revolution Kuznetsov worked with great enthusiasm. He participated in the design of revolutionary festivals, the publication of the magazine "liberation", he taught, was engaged in many artistic and organizational problems. His energy was enough for all. 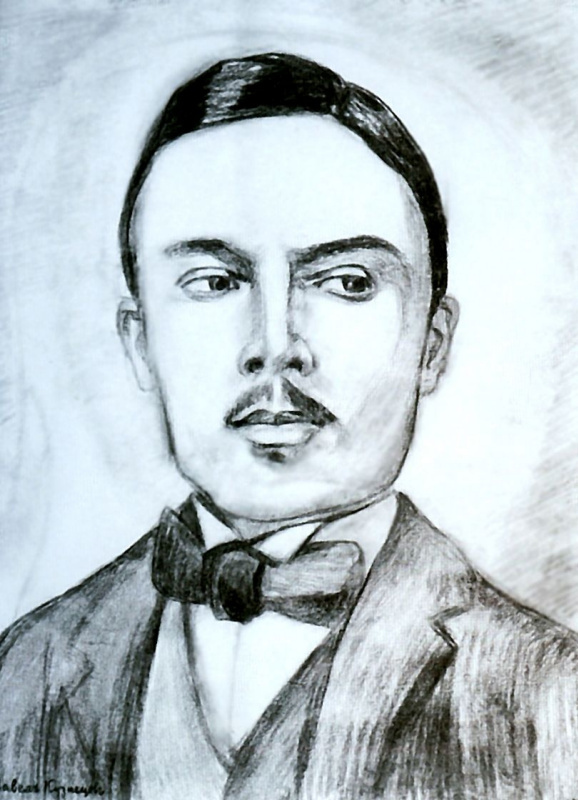 During this period, he creates new variations of Oriental motifs, noted the influence of ancient art; among his best works are magnificent portraits of E. M. Bebutova (1921−22); then they published a series of lithographic "Turkistan" and "Mountain Bukhara" (1922−23). Attachment to the elite circle of the subjects did not exclude the reaction of the artist to the current reality. Under the impression of the trip to Paris, where in 1923 was arranged his exhibition (together with Bebutov), Kuznetsov has written the "Paris of the comedians" (1924−25); in this work its inherent decorative laconic style round suddenly with a sharp expression. New discoveries brought the artist’s visit to the Crimea and the Caucasus (1925−29). 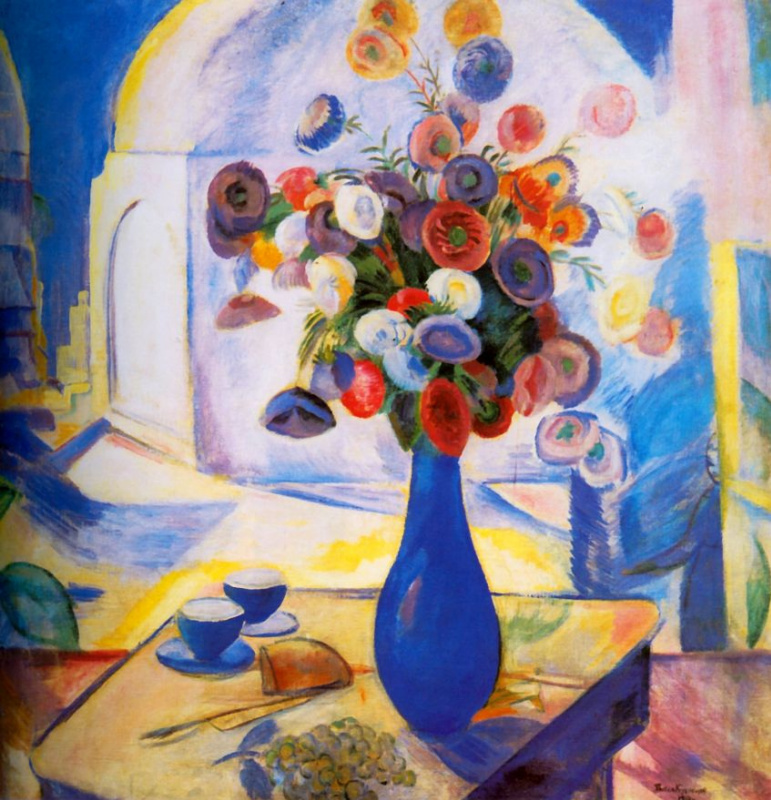 Rich with light and energetic movement, the space of his compositions gained depth; these are the famous painting "the grape Harvest" and "Crimean farm" (both 1928). During these years, Kuznetsov aggressively sought to expand your story repertoire, addressing topics of labor and sports. 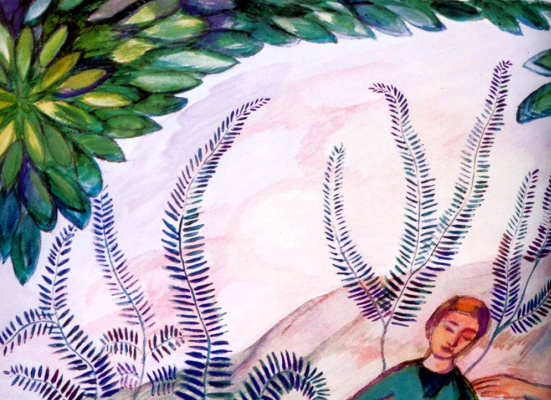 Stay in Armenia (1930) brought to life a series of paintings, embodying, in the words of the painter, "the collective pathos of the monumental building where people, cars, animals and nature come together in one powerful chord". With all sincerity desire to respond to social ordering Kuznetsov couldn’t quite satisfy the Orthodox new ideology, often subjected him criticized for "aestheticism", "formalism", etc. the same allegations were addressed to other masters Association "Four arts" (1924−31), a founding member and the Chairman of which was a blacksmith. The works created in the late 1920s — early 1930s (including "portrait of the sculptor A. T. Matveev", 1928; "Mother", "bridge on the river Xan-GU", both 1930; "Sort cotton", "Pushball", both 1931), the last high rise of creativity Kuznetsova. The master was destined to far outlive their peers, but also advanced in years, he never lost his passion for creativity. In later years, Kuznetsov primarily occupied with landscape and still life. And although his recent works are inferior to the former, longevity Kuznetsova is impossible not to recognize the phenomenon exclusive.